THE SLEEP THAT LASTED 1,000 YEARS! Splash Page selected from ACTION COMICS NO.152, January 1951. Superman and Lois Lane think that have travelled sleeping 1,000 years to the future to the year 2,950. Actually they have travelled un hour and they wake up in the planet Venus. Cover by Wayne Boring and Stan Kaye. The other adventures are from: Tommy Tomorrow, Congo Bill and Vigilante. There is a Superboy page with advices to young people. 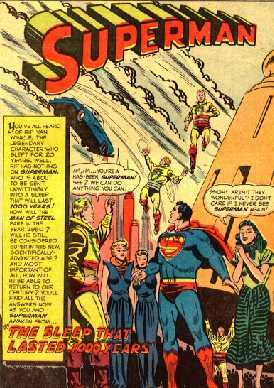 'Splash Page' seleccionada de la serie ACTION COMICS en su número 152 de Enero 1951. 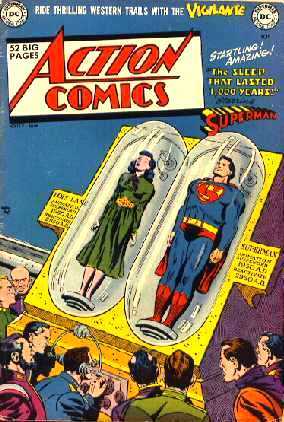 Superman y Lois creen viajar durmiendo al futuro 1.000 años, de 1950 al 2.950. En realidad han viajado durante una hora y han despertado en el planeta Venus. Portada de Wayne Boring y Stan Kaye .Las otras aventuras son de Tommy Tomorrow, Congo Bill y Vigilante. Contiene página de Superboy aconsejando a la juventud.